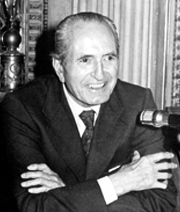 Ignazio Gardella was a member of the so-called third generation of the Modern Movement. He is considered one of the greatest exponents of Italian Rationalism, although he followed its principles in a much personal way, searching to overcome its limitations. Ignazio Gardella was born in 1905 in Milan to a family counting already with four generations of architects. He graduated in Civil Engineering in Milan in 1931, and in Architecture in Venice in 1949. In his beginnings, Gardella collaborated as a designer with Olivari, Azucena and, especially, with Gavina. Meanwhile, he also traveled in order to improve his training: he went to Germany Frankfurt in particular- and the Scandinavian countries, where he met Alvar Aalto. In 1935, Gardella published his first works in the magazine Casabella, owned at the time by the publishing house led by Rogers, a very relevant figure in the world of architecture at the moment due to his innovative methods in teaching Italian architecture. During that period, Gardella carried out projects such as the Antituberculosis Clinic and the Laboratorio Provinciale di Igiene, both in Alessandria. The first building is considered one of the purest examples of Italian Rationalism. Nonetheless, Gardella soon felt the need to overcome the rigid limitations of the Rationalist style. Gardella founded in 1945, along with some other young architects in Milan, the Studi Architettura Movement. That same year, he started his career as a professor in the Istituto di Architettura in Venice, an occupation that lasted 25 years, until 1975. Together with Albini, Samonà and Rogers, he ran the summer courses of the CIAM in Venice between 1952 and 1956. Gardella, Magistretti, De Carlo and Ernesto Nathan Rogers represented Italy in the Otterlo meeting in 1959, which was the 11th and last congress of the CIAM (in this way the International Congress of Modern Architecture came to an end). Gardella received many awards throughout his career, including the Olivetti architecture national award (1955) and the Fiuggi award (1988). He was also honored, among others, with the honorary memberships of the Accademia di Belle Arti di Brera in Milano and of the Accademia di San Luca. Ignazio Gardella was pretty critic with his own work, and showed it in his writings. In these writings he stated his will to overcome the rules of Rationalism and the limits of the Modern Movement: sensitiveness and the eye are seen as the new tools to create new forms and textures. Following this statement, he created the Digamma armchair, produced in 1957 by Gavina. It is edited nowadays by Santa & Cole, and in this armchair Gardella showed his capacity to join harmoniously elements that belonged to opposite styles at first sight, a common characteristic of most of his works. The Digamma armchair achieved to overcome Gardella's links with Rationalism: its body is Rationalist (the seat and the back) but its joints (arms and legs) are Ultrarationalist it is a little masterwork of great aesthetic and formal value.